With 250MBps transfers and 12TB of space, there's plenty to love. Seagate's Barracuda Pro 12TB reminds us why at least some hard drives can remain relevant despite the swift encroachment of SSDs. Until we reviewed its predecessor the Barracuda Pro 10TB last year and tasted its 250MBps read performance, we hadn’t given hard drives much thought for a while. To be blunt, year after year of 120MBps - 150MBps transfer rates had became boring in a world of blindingly fast SSDs—even with the steady and admittedly enormous increases in capacity. The Barracuda Pro 12TB reviewed here is just a hair faster than the 10TB version, but the additional 2TB of capacity is truly a fantastic thing. We can remember $800 4GB hard drives (as well as 8-inch floppies and Winchester drives if we’re honest), so color us intrigued to see just how far Seagate and the industry can take things. 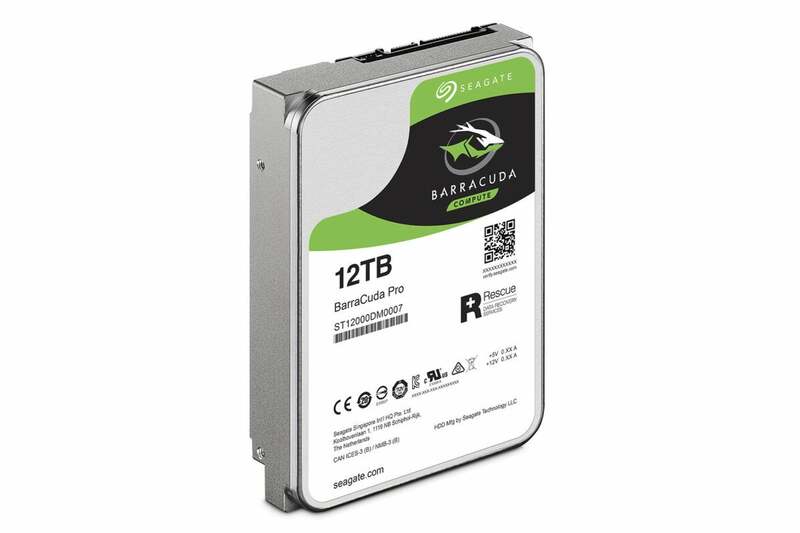 The Barracuda Pro 12TB is a 7,200 rpm, 3.5-inch hard drive with 256MB of onboard cache. It employs a SATA 6Gbps interface, uses PMR (Parallel Magnetic Recording), is filled with helium for less drag, and is said to draw 7.8 watts—a relatively small amount of juice for a hard drive. 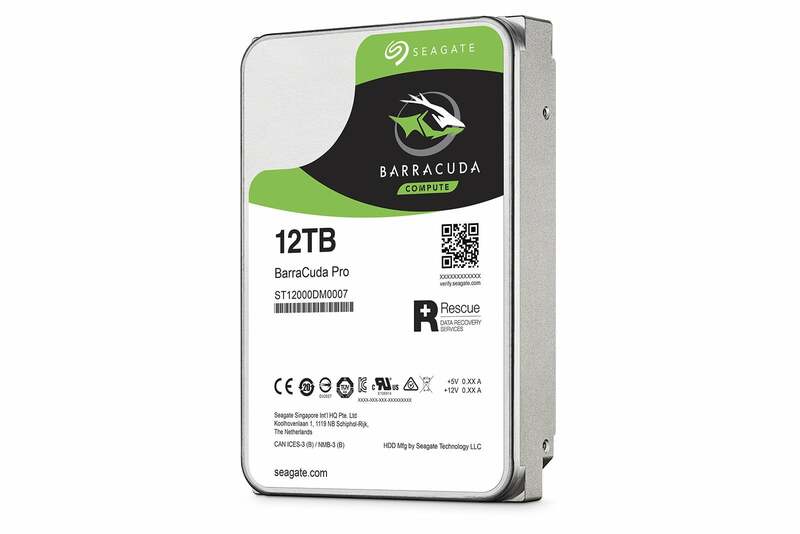 Seagate's Barracuda Pro 12TB looks like hard drives have always looked, but the latest technologies allow far more capacity and greater sustained throughput. Seagate warranties the Barracuda Pro for hefty five years, and there’s two years of Seagate Rescue data recovery included. (Keep your fingers crossed that any drive failure occurs early—if at all). Beyond that, it’s just your run-of the mill hard drive in size and appearance. We test using the AS SSD and CrystalDiskMark benchmarks. To those synthetic tests we add real-world copying of a single large 20GB file, as well as a 20GB mix of smaller files and folders. The thought of a hard drive transferring large amounts of contiguous data at 250MBps was fantasy not so long ago. 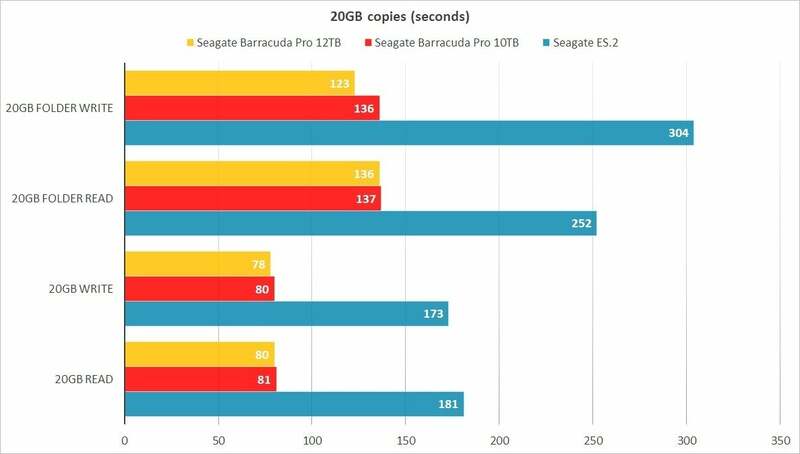 The Barracuda Pro 12TB does it, and in our testing, it did so consistently. Even small 4K performance is consistently 30 percent to 100 percent improved over the old school. New school versus old school. The ES.2 wasn’t a fast drive in its day, but it wasn’t really slow. The Barracuda Pros make its throughput look anemic. 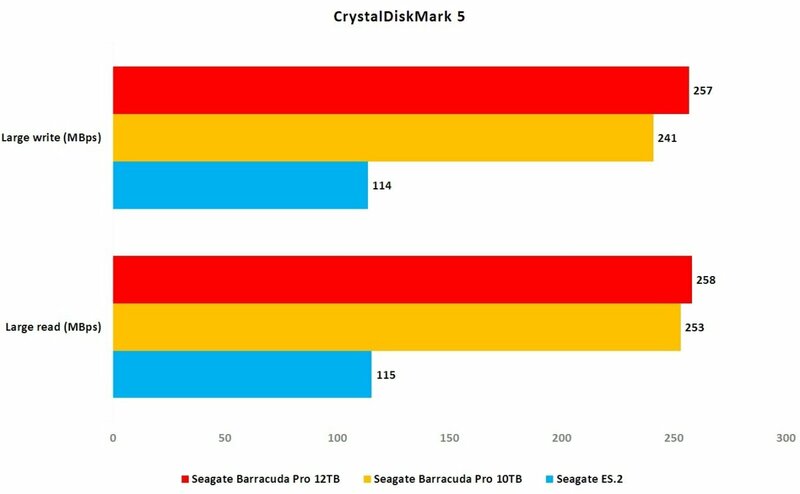 AS SSD (not shown) actually rated the Barracuda Pro 12TB a bit slower than CrystalDiskMark did, but CDM's rating is closer to what you’ll see in the real world. This is reinforced by our 20GB copy tests, which pretty much flat-lined (in a good way) at 250MBps, both reading and writing. The 12TB version is only moderately faster than the 10TB Barracuda Pro. 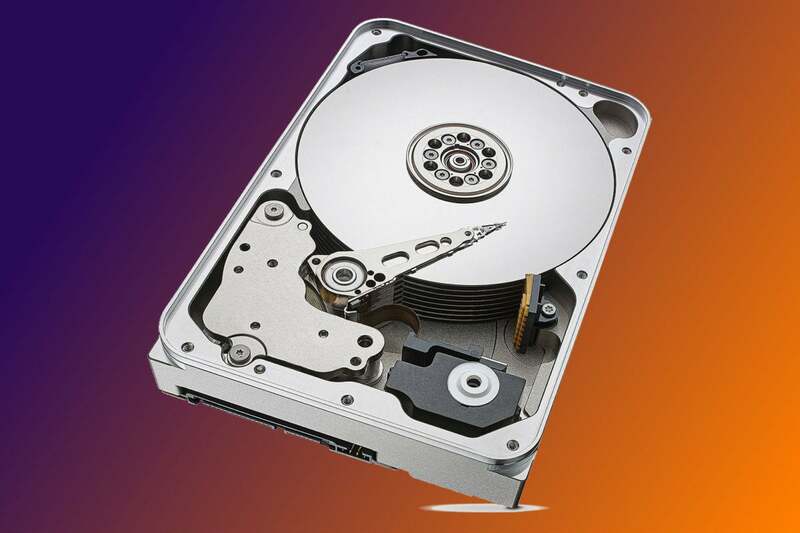 Note that with all hard drives, transfer rates vary according to where the data is on the platter. As the outer sectors are filled, and more data is written to the drive, speeds may drop as the inner sectors come into play. With the relatively small amounts of data we used, this phenomenon won’t show up. We haven’t tested the lower-capacity 8TB, 6TB, 4TB, and 2TB drives, but the performance claims decrease progressively, albeit modestly—most likely because they have fewer platters for distributing data. Having verified the 250MBps and 220MBps claims for the 12TB and 10TB models, we don’t hesitate to believe the 195MBps spec for the $130 2TB drive, which is a more likely to fit the average user’s budget. The helium-filled Baracuda Pro 12TB ran only mildly warm during our tests, and it's also relatively quiet. You can hear the heads seeking, but buried in a system the noise level is more than acceptable—if you even care about such things. We don’t hear it in the noisy city, but we hear quite often from readers who do. With eight platters, the Barracuda Pro 12TB has plenty of places to store data. If you have a lot of digital stuff, there’s no vaster or faster hard drive to store it on than a Barracuda Pro 12TB. But it's not cheap, and its size and price bring up another consideration: Backup. Sure, we've reviewed plenty of good Windows backup software and online backup solutions, which you could theoretically use with this drive. Given the amounts involved, however, the only truly viable way to safeguard 12TB worth of data is to buy two drives and mirror them. That’s an investment of over $1,000 for your storage. You could skip the mirror drive if you’re not keeping irreplaceable data, but irreplaceable is in the eye of the beholder. Seagate's Barracuda Pro 12TB is the hard drive that turned our head—darn if it isn’t enticingly fast and roomy. If that’s out of reach, we’re reasonably confident you’d be happy with a less capacious version. This hard drive is the fastest, vastest currently available for storing and transferring large files. With a 5-year warranty and 2-years of data recovery, it's also a reasonably safe investment.